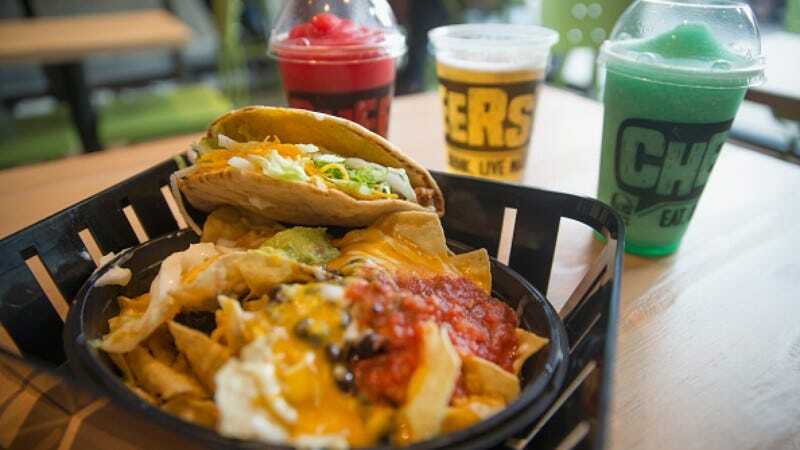 When it decided to skip the pretense and just start serving booze alongside its Chalupas, Taco Bell moved one step closer to fulfilling its destiny as the victor of the franchise wars. In addition to offering beer and alcoholic slushies, the new “upscale taqueria concept“ Taco Bell Cantina also featured swankier digs and on-site DJs, effectively eliminating the need to go anywhere but Taco Bell on the weekend. There are now seven Taco Bell Cantinas across the country, with plans to open four more before the end of the year. Yes, it would seem that this gamble worked out nicely, and that Taco Bell could pat itself on the back—or down a Twisted Freeze—for its bold vision. But while celebrations are probably still in order for executives and major stockholders, Business Insider reports the fast food chain was really just bending to the public’s will. Mike Grams, Taco Bell’s COO, says “People would come through on drive-thru and say, ‘could you please leave a little off the top.’ We’d know exactly what they meant.” So, rather than continue to fume as college kids dumped Skol into their Taco Bell cups, the company decided it might as well just hand over premixed drinks, like a Mountain Dew Baja Blast with Ketel One Vodka. And Taco Bell‘s never looked back—nor does it plan to start serving shots. “You can’t go on in there and get a shot,” Grams told Business Insider. “We’re not doing bars.” So don’t confuse the place with loud music, long lines, and booze for that other place with loud music, long lines, and booze.